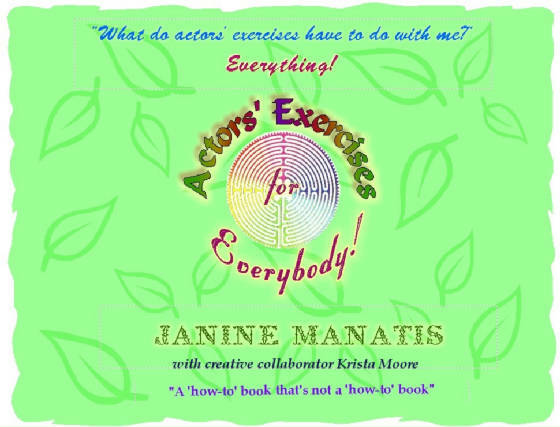 "Actors' Exercises for Everybody!" by Janine Manatis with creative collaborator Krista Moore.c 2011. "If indeed 'all the world's a stage', and we are each here to 'play our part', shouldn't we learn to play it to the best of our ability?" 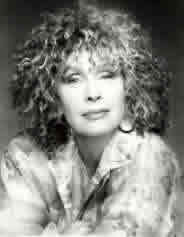 From working among some of the "Greats" at the The Actors Studio NY (like Tenessee Williams, Gage Kazan, Marilyn Monroe, Paul Newman, James Baldwin) "Looking Back"to teaching Actors/Writers/Directors worldwide (like Kevin Costner, Bruce Dern, Sandy Dennis, Delroy Lindo & more), Janine Manatis has developed her own “method” of training people, incorporating knowledge from the Arts, Sciences, Psychology, Metaphysics, Body/Mind/Spirit and Sensory work, which finally evolved into her original "8-Step Paradigm". At the request of many who wanted to participate in her workshops in LA, NY,Toronto, Montreal, Paris and even Israel, she began to extend these exercises to: Lawyers, Health-Care Practitioners, Yoga Instructors, Therapists, Business Executives, Sales Personnel, Artists - and even a Tiger, Bear and a "Kissing Whale"! * After years of working with a variety of clients, she learned "the work" really is for anybody seeking a better way of life. Inspired to offer this work to “Everybody”, she decided to write a book - a “how-to” book that’s not a “how-to” book. Please read the Copyright statement below. Thank you for your cooperation. All Rights Reserved. No part of this book may be reproduced or published by any means, whether by print, electronic, public display, recording or any future means, without express permission by its creators. Select quotes may be used with direct reference to its author, source or origin. The website may be forwarded in its entirety with its Copyright statement intact. Q. "What do have to do with Me?" "A wonderful book for all..."
JOIN OUR LIST FOR MORE! Enter your name, email address and comment/question below. Your privacy is very important to us. 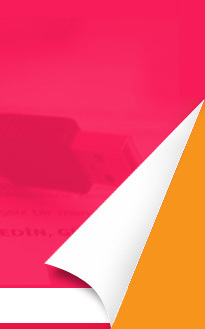 Your email address will never be shared. "A great book for everyone." for "Actors' Exercises for Everybody!" "The journey of a thousand miles begins beneath your feet". star coach be a star in your own life, method acting, training, authentic self, best coach, star coach, kevin costner, actors studio, janine manatis, krista moore, actors exercises, actors exercises for everybody, book, free resource, free showcase, methods, examples, sensory walk, best self, true self, authentic self, how to live more consciously, alive, aware, happy, successful, free books, method of training the stars,now available to everybody! "EVERY LIFE IS A JOURNEY"
"YOU DO NOT HAVE TO BE GOOD"
ACT III: "Ensemble, The Method, & ALL THAT JAZZ"
"MAYBE IT'S NOT TOO LATE"